Early in the morning I drove up to the Columbia Icefield to meet up with friends who were camping at the campground. Along the way took pictures and slept, I was bit tired. We decided to hike the Parker Ridge, great day for it. The morning started out with temperature just below zero and clear blue sky. The view on top was great, as we rested behind cover from the wind several Mountain Bluebirds provided us company. All good hikes must come to end, as we were about to leave the parking lot, we saw a bird that had scared away two ravens from top of a tree. Everyone had to leave before identifying the bird, but I decided to grab my camera and stick around. I looked at the bird through my camera and got exited, a beautiful bird that I had not seen in nature before. Also I was excited I spotted it in Banff National Park, just few kilometres from Jasper National Park. Before my friends in Jasper get upset, let me explain. As a photographer I have given myself few lifelong assignments. We live in this amazing country, which offers endless places to photograph. But being a home body, I have long decided to focus my photography to Banff and its national park neighbours. As well I want to take pictures in Banff of all the birds that have been spotted (260 plus) in Banff National Park. I may never get to 260, but will have fun trying until someone takes the camera out of my cold dead hands. 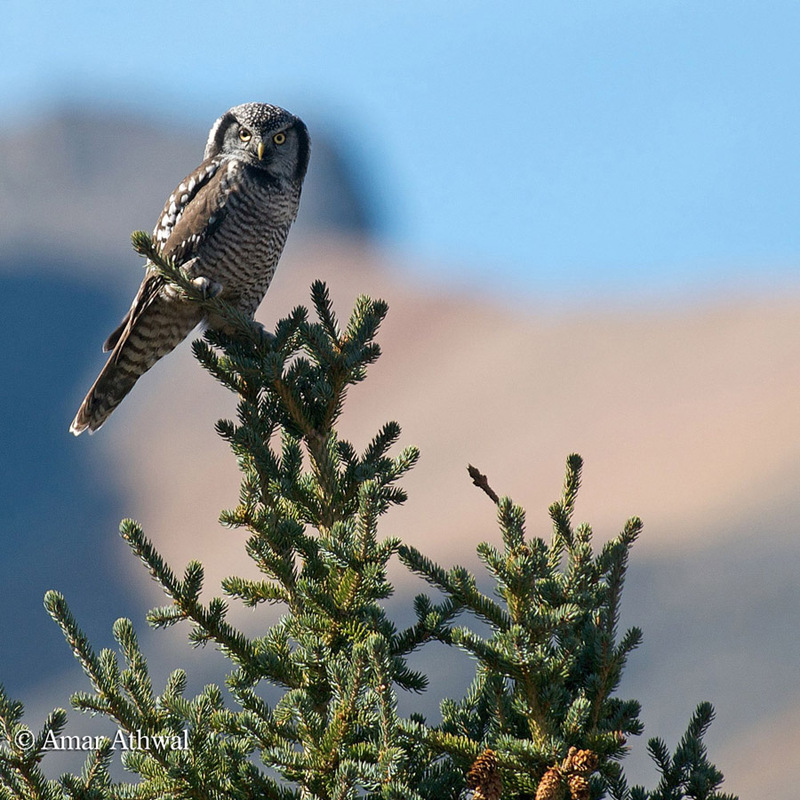 With that said, I can check off the Northern Hawk Owl from my list, but will always be happy to take pictures of this specie and all other again, and again and again. It’s so much fun!